Duration: 2 – 2 ½ hours (I took 2 ½ hours as I was taking photos and getting lost, and generally enjoying the scenery). Difficulty: Moderate. The route is fairly flat and you mostly have proper paths to walk along. The paths in November were fairly muddy in places – I would recommend waterproof shoes i.e. walking boots or wellies. Terrain: Beach and cliffs, wooded track along Holywell Dene, fields. Dog Friendly: Dogs can be off the lead most of the time along the beach, cliffs and fields. There is a small stretch of road between Old Hartley and Holywell Dene where they needed to be on the lead, but all the fields were either for crops or horses – nothing for your pooches to chase! Start Point: As this route is fairly circular, you can start from a number of parking spots along the route. I chose the Briar Dene car park (Postcode: NE26 1UE) as its free to park and right on the beach. Like I said, I wont be giving detailed descriptions of the walk, as you have the map, but I will include photos of bits where you might get lost, just to make things easier for you! When I did this walk at the end of November, I chose a day that was chilly but bright; when I stopped and checked the weather when I arrived at The Beehive, it was 6 °C and sunny. When you’re walking along the cliffs its quite exposed so I would wrap up warm if there’s a bit of a breeze coming in from the sea. 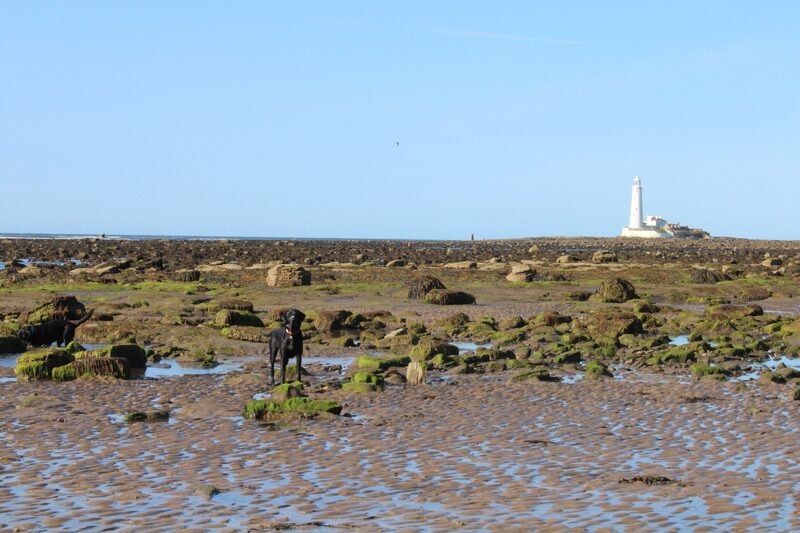 I would also suggest checking tide times for the beach, although you can get along the beach for this walk even when the tide is right in – if you want to go across to St Mary’s Lighthouse, you need to be sure that the tide will be out! The dogs always love playing on the beach, although they’re more interested in each other than the camera! St Mary’s Lighthouse is in the background – it’s no longer used as a functioning lighthouse, but you can go across to the visitors’ centre and shop. If you go across to St Mary’s Island, you can sometimes see seals on the rocks as you look out to sea. The rock pools around the lighthouse are always full of interesting creatures, including star fish! The rocks themselves are littered with periwinkles and limpets too. The labradors are not a native species, but they do love to dig in the water! There are beautiful views of the lighthouse on the cliff tops as you head towards Old Hartley. The path is fairly easy going with fields to your left and the sea to your right, until you reach a car park, go through the car park and head towards the Deleval Arms. The dogs need to be on a lead from this point as we cross the road and head down to Holywell Dene. Holywell Dene is really lovely, if you look up to the left, you can just about see Seaton Delaval Hall and the Obelisk. This is apparently where one of the heirs to the Hall fell off his horse and died. The Hall is now owned by the National Trust so you can visit if you like. Turning left and heading along the path on the far side of the river, follow the path along until you come to a bridge crossing the river. Leo’s just watching Max playing in the water. Max is a true water baby, like a lot of labradors, but Leo can just take it or leave it. After the bridge there is a series of steep steps that bring you to a road. This is probably the steepest part of the walk, don’t worry – it’s all pretty flat after that, and you’re nearly at the pub! Follow the Public Footpath signs along past the Briar Dene Farm, then cross the Wagon Ways where you’ll see a sign post for The Beehive. There are often horses in this field, so if your pooch isn’t keen, I’d keep them on a lead here. Mine are fine so I let them roam until we get to the pub car park. Now you can settle in at The Beehive and enjoy a long lunch! In the summer there are plenty of seats outside and they have a ‘Secret Garden’ with a play area for children. Today though, it’s getting cosy inside for me before the (shorter) walk back. After a couple of hours in The Beehive, we set off back towards the Briar Dene. With it being November, the light was starting to go quite quickly, which made for some nice photo opportunities. We walked back across the horses’ field towards the Wagon Ways track, then turned left along the side of the golf course and across the fields. The track here was the muddiest of the whole walk, but you could avoid it with a bit of effort. As the light was fading, it took all of my photography skills (which are slim to none) to get a good photo of the sky as the sun was going down. The views and the colours of the sky across Whitley Bay Golf Course were simply magical, but I’ll leave you with a couple of photos looking up from the Briar Dene. This is an unedited view that I managed to capture with my camera. Hopefully as time goes on, my photography skills will improve and I can really show you the impressive views and scenery that Leo, Max and I get to experience on our walks (admittedly, the dogs don’t necessarily appreciate the views!). Thanks for getting all the way to the end of this post! I hope you enjoyed it. This is the first of many adventures in the North of England. Please have a look at the rest of the walks and blog posts on this site. If you have any comments or suggestions you can always contact me via the website or social media.